"How did this even get on the air?" Both the die-hard fans and bewildered haters asked that question about Twin Peaks, David Lynch and Mark Frost's surreal television drama that famously aired on ABC primetime in 1990 and 1991. That such an unconventional vision — and one realized, at least throughout the first season, with such thorough commitment — ever made it to the mainstream airwaves now seems like a historical achievement in and of itself. So how, given the stultifying rigors of the entertainment industry, did Lynch and Frost actually sell this package of cryptic dreams, backward speech, small-town savagery, a murdered homecoming queen, and damn fine cherry pie? 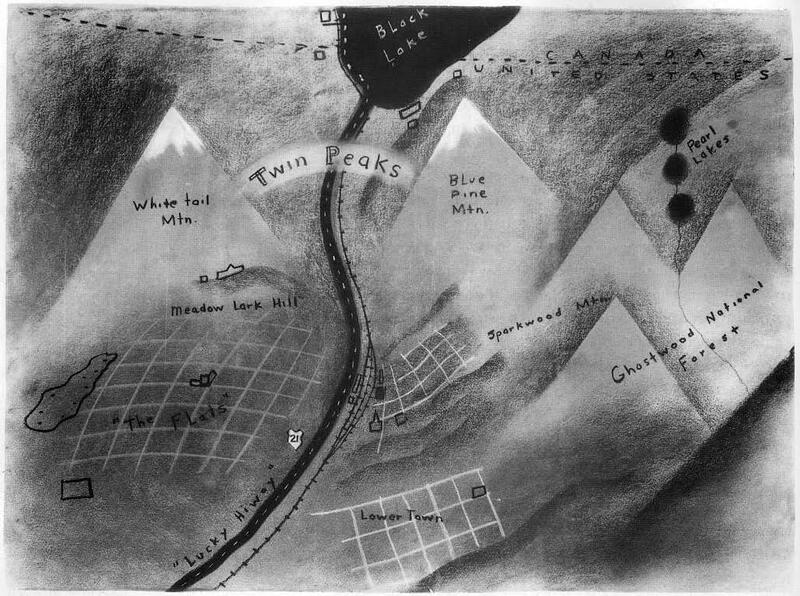 First, Lynch drew a map. Knowing that no TV executive would understand Twin Peaks without understanding Twin Peaks, the fictional Washington town which gives the story its setting and title, he drew what you see above. Nigel Holmes included it in his out-of-print Pictorial Maps, commenting that "the peaks of the title, and the town they name, are clearly visible as white-topped mountains rising out of the modeled landscape. By creating a sense of place, Lynch made the town all the more believable. A straightforward map would have been dull by comparison and might have suggested that there was something intrinsically interesting about the geography of the place. What was much more important to convey was the mood of the story, and it’s nicely captured in Lynch’s quirky drawing." The book also includes a quote from Lynch himself, on the utility of the map: "We knew where everything was, and it helped us decide what mood each place had, and what could happen there. Then the characters just introduced themselves to us and walked into the story." As any Twin Peaks fan will notice, the map identifies a host of locations referenced in the show, such as White Tail and Blue Pine mountains (the peaks themselves), Ghostwood National Forest, and Lucky Highway 21. But "can you locate Sparkwood and 21, One-Eyed Jack’s and The Great Northern?" asks fan site Welcome to Twin Peaks. And if the much-discussed 21st-century Twin Peaks revival comes to fruition, will it dust off this trusty reference document and revive the askew but deep sense of place we (or at least some us) savored the first time around?